This rugged ammunition manufactured by Wolf WPA Polyformance is made in the heart of Russia. This product is steel-cased, polymer coated, berdan-primed, non-corrosive, and is non-reloadable. Please note that Wolf does NOT recommend using this product with any Smith & Wesson M&P 15 rifles. See http://wolfammo.com/advisory.html for details. Fired well over 500 rounds through my sw m&p sport 2 with no issues. Great ammo for the money. And delivery is very fast. Love buying here. Excellent to keep proficient with. Even though I clean it a little extra, I don't mind rodding out my barrel on what I am saving on ammo prices with it! 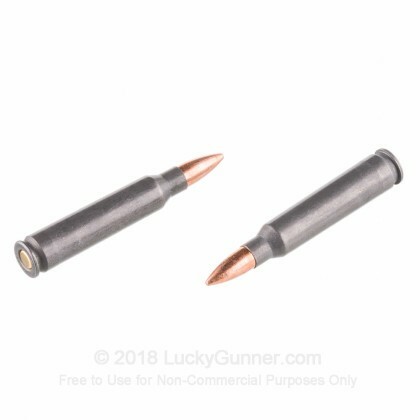 Have read reviews and found that this ammo doesn't work well in all ar's. Worked great in my S&W Sport2. Shot 200 rounds with no issues. Even tried rapid fire with no problems other than startling a few people in the range next to me. Found the ammo to be quite accurate at 100 yards. Only thing that was expected was a little more cleanup as the primer is fairly dirty. Have been told that the steel casing will wear down the extractor but for a five dollar extractor the money you save will be well worth it. Looking to by 1000 rounds now. I put over a thousand rounds down range through everything from home built ARs to a Ruger AR556, Sig M400 Varminter to LaRue Stealth and PredatOBR. They all functioned well. These are not target rounds but are good for a couple minutes of angle. For the price, they are great rounds to build and maintain proficiency. Won't run in my gun! I shot these in my Ruger AR556 and it was mostly fte every time. My rifle just would not run this ammo. As soon as I switched to PMC all problems vanished and the gun ran flawlessly! Great service, product & availability! The wolf 223 55grain ammo is fantastic and no issues target shooting rapid fire. Just what I wanted. My colt 556 short barrel ar15 loves this wolf ammo. Highly recommended!!! The price is great and Ammo shoots with no problems. Ammo feeds flawlessly and is plenty accurate, although it is a little bit dirty. I have shot over 1000 rounds through my S&W no FTF am hitting a 4 gong at 200 without any problems, a golf ball at 150 yards and tennis balls at 300 yards. I will be buying more soon Thank you. I experienced 6 misfires out of just 250 rounds. Works well enough for practice, but not at all recommended for any other than that. This round is great for training. I have fired about 750 rounds without issues. If you want to put lots of lead down range and not kill your wallet buy Wolf 223. Worth every penny! Just went through almost 400 rounds yesterday at the range with my cousin while doing some military drill shooting and reloading. We had no FTEs, FTLs and FTF. All of them shot flawlessly and I will be buying this ammo again soon. Just what I was looking for to take to the range and run through some mags in a newly purchased AR. Rifle and ammo functioned flawlessly together and couldn't be happier. Ammo shoots great. I'm not the proclaimed professional shooter nor a every weekend one but first weekend that I had this ammo I shot just over 100rds no problems at all with it loading or shooting. I cleaned my gun after I shoot every time not really dirty either. I have just a regular dpms orical ar nothing fancy. Once I finish the rest that I have I will buy the same again no second thoughts about it. Shoots fine for the range! No issues in my AR-15. I had zero FTE or FTL's. I mean the steel case is no issue either. Get this back in stock and I will buy more.. Excellent product at a low price. Excellent ammo at a low price. Excellent service at Luckygunner. Thanks a million!!! I shoot the Wolf 55 gr. FMJ in my Colt HBAR as well as my M-4 style rifles. It groups as well as the Lake City. And better than the P.M.C. 62 gr. Green tip. No malfunctions to date. Just put the first 100 rounds of this ammo through my AR from Windham Weaponry. This ammo has a great price but jams every 4 to 6 rounds. I put PMC and other rounds through this AR without a problem. I have to give this ammo a thumbs down. Cheap price is not always better. Been looking for ammo that is easier on the pocketbook but will preform as required. Had no issues at all when firing from any of my AR platforms or Tavor. Keep in mind that not every firearm is the same so before you buy bulk buy a box and see if your firearm will cycle as designed. after shooting 10 rounds from my pmag30 it ejected but did not chamber next round several times . Last 5 round functioned properly. Fast Shipping and please at how quickly I receive this product. I purchased a box of 500 rounds and went to the range this past weekend with the kids and we went through 400 rounds of the Wolf .223 without a single misfire or Jam...No problems loading in Magpul mags and they feed without a hitch. 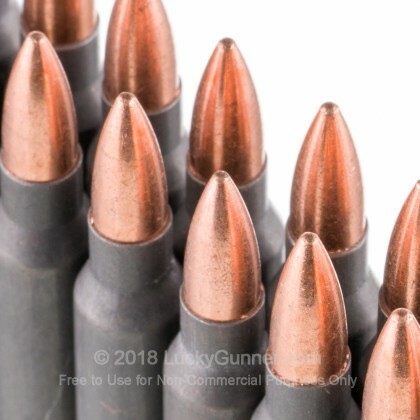 Using my Bear Creak Arsenal AR-15 and found them to be very accurate as well...Love purchasing my ammo from Luckygunner.com...I have also bought 9mm and .40 from this site, and I have never had a problem..Thank You LuckyGunner. 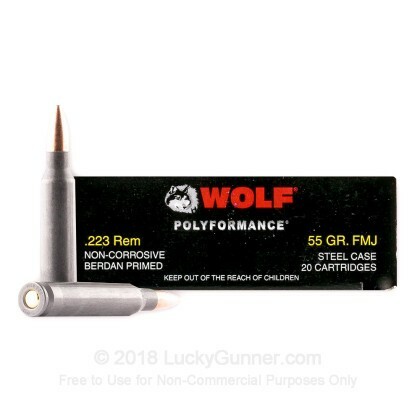 Purchased a box of 500 rounds of Wolf .223 55gr FMJ and was very satisfied with the quickness that Lucky Gunner ships their products. Shipping was fast and received product in Great condition. Took the kids to the range and we went thru 400 rounds of the Wolf .223 without a single Mis-fire or Jam...Very Happy with this product and will be re-ordering again in the very near future.. Always had good results from these rounds and the price makes it easy to stock up on as well. Haven't gotten to shoot any of this ammo yet however I'm hoping that it shoots adequately as practice/target ammo that it is intended for. For the money it's sure worth a try. Shot all 500rds out of a Windam Weaponry I just added to the collection not one cycling problem..
Ive shot about 150 rds so far without issue, if people try to talk you into more expensive brass ammo its probably because they've never shot steel. It loads just fine in my magpul mags and feeds perfectly. It maybe a bit dirtier than "better quality" ammo but for the price you cant go wrong; after all you need to clean your gun anyway! This is good ammo and low priced but will not feed from my Keltec AR-15 magazines due to excessive length. Perhaps my lot of ammo was not typical but I had to buy metal clips to shoot this ammo. The metal clips are thinner and allow the slightly longer rounds to feed properly. Have fired about 400 rounds in 3 trips to range and absolutely no problems with feeding, loading and firing. Great range ammo for very low unit cost in comparison to other brands. Great ammo for quick multiple target practice with out feeling the guilt of blowing a tank of gas in five minutes. Perfect for my AR and super fast shipping! I fired around 150 plus rounds of this ammo without one problem. I was leery at first with the low price but I was so satisfied with the performance that I bought another 1,000 rounds. It was also $30 less per 500 rounds than when I purchased it at a great price. Have no worries when using this ammo. Have not been able to get to the range and use the ammo, however for the price, as long as it will shoot I will be completely satisfied. Great price and very easy and super fast delivery. Thanks for the excellent service. Will purchase from lucky gunner again. Thanks again. I bought 1000 rounds. Shot the first 150 through my AR that I built. Apparently SAA uppers don't like this ammo all to much. Had a round cement itself in the chamber from the coating on the casing. Maybe it is my gun that just doesn't like it. Have plenty of friends who shoot it no problem. Great price and great quality just not for my gun. Great inexpensive ammo. No FTE, FTF. WPA ammo always been a choice ammo. I shot about 200 so far with no failure to fire or eject. No complaints. Excellent choice for an inexpensive an fun time. Bought a case of this for a defensive carbine class and had no problems at all. Shot all 500 rounds in 6 hours and functioned perfect. Load is a little lite can definitely tell the difference in recoil from high quality ammo. Shooting from cover 75 yards out could get 2 inch group on steel. Hello All, now that ammo prices are falling some I thought I would stock up for the collapse of the USA and the impending zombie apocalypse. What, no zombies you say, wait till all this 'legal' marijuana kicks in, y'all will see plenty of zombies! OK,, so seriously, what a great price for ammo to head out to the range and burn this stuff up. It's always nice to shoot when it doesn't hurt, it brings the fun back into it. And it keeps your skills sharp for the, well you know what. Stay safe and shoot straight. No issues. 300 rounds thru AR-15 good target ammo does have steel cases instead of brass but functioned fine. I liked the price and the Performance was excellent!! the price is great but my gun seem to be more accurate with the rem. ammo I purchased before. Shot 280 rds only one light strike. 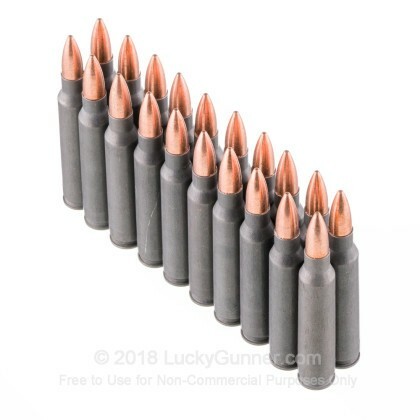 Affordable practice ammo than brass. My ar liked it give it a try. Several jams. I would not recommend these. Spent more time clearing them than shooting them. I guess I got what I paid for. Lesson learned. Best price I could find-prompt shipping. These 55 gr Wolf rounds are what I expected. Mediocre performance, cheap for the number of rounds available, & excellent quality. I have bought over 2K rounds and fired 1K. The rounds cycled well and I did not have any function issues while firing. I grouped 2 inch group with an ACOG TA31RCO BAC Rifle @ 100 yards with a BCM mid length DI upper 16" barrel, 1/7 twist. I was also using these rounds in with some PMC 55 gr brass rounds. 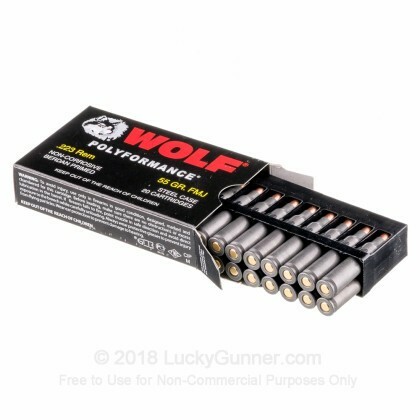 The Wolf rounds are definitely lower power due to the rounds ejecting back @ about the 5 o'clock from the ejection port and the recoil felt softer. The PMC rounds were ejecting at 3 o'clock, hitting the brass deflector, and the felt recoil was a little bit more noticeable. These Wolf rounds are excellent for doing an initial break in of the weapon and just pure blasting. The accuracy is more in line with "practical" accuracy where you just hit the target vs pinpoint accuracy like a match grade round. Lucky Gunner has been thus far an excellent company to do business with. The orders were done quickly and shipping was fast. I would definitely do business with them again and would recommend my friends to this site. very satisfied and excellent service and fast shipping . Cheap, but they shoot. ~ 3" groups at 100 yards in a gun that will print 0.5" groups with good ammo. Sticks in the chamber too, making ejection difficult (rem 700). Found that a very light misting of case lube makes them functional. I have a feeling these will be on the back of the shelf for a long time before the get used up. very pleased. this ammo feeds and groups beautiful! it is a great value for a day at the range. i am shooting a bushmaster ar15c, topped with a bushnell ar-223 scope. this ammo will key hole at 25 yards. if i could hold steady it would at the 100 yrds, but thats the operator. Sadly, I haven't gotten to try out the product yet. The service was great. It came in a nondescript box, and even someone called to make sure all the information was right after the order was made. Very good performance and a great value. The steel cases don't feed as smoothly as brass but it's that way with most all steel cases that I've encountered. I would buy this ammo again. Shot great and awesome plinking ammo .. Keep the price low!! next time i'm getting a 1000 rounds . Great job guys keep up the good work ! Not the best ive ever shot and not the worst either. Good ammo for the price, fairly accurate out to 300yds, and great for just hitting the range to blow off some steam. No failure to feed or other issues in the 200 rounds ive put through my AR15. Good ammo, used it to teach my nephew how to use the AR15 and it worked with no issues. As noted above, all round performance is excellence!!!!! Delivery time was excellence!!!!!!! I have no complaints whatsoever....Please keep up the good work!!!!!!!! Thank All of You!!!!!!!!!!!! So far this ammo is performing great, out of about 200 rounds I only had one misfire. Great value, I should have picked up more for that price! Good, reliable ammo that goes bang everytime. Excellent for plinking, great price and fast shipping ! Great bang for your buck!!!! Just purchased a new AR. Purchased 500 rounds for zero and practice. Shot 250 rounds without a problem. The weapon appeared to be dirtier after firing than I remember my M16 being (Carried and fired an M16 22 yrs in the Army). However, not a problem because, I clean my weapon after every firing secession regardless of the number of round fired. I’m considering my next order to be 1,000 rounds. You cannot beat the cost per round. Have heard that the poly melts in the chamber but I did not notice any build up. Bought 1000 rds. No problems. Work just like they're supposed to. Can't beat price, unless you want brass to reload. I'll buy more. Keep the price low. Ordered 500 rounds. Cheapest website I could find. Shipping was quick. So far no problems with what I have shot. Had been through about 200 rounds without a problem when I had a misfire. When I jacked the chamber, the unfired round and the loose, unignited but well struck primer came tumbling out together. I've put a lot of ammo downrange but had never ever seen a primer fall out of the casing before. I'll probably order again but this certainly cooled my earlier enthusiasm for this ammo. I got 500 rounds for the cheapest on the internet. Shipping was fast and the product showed no signs of wear and performed flawlessly. Definitely coming back. Bought for long term needs/storage. Opened a few boxes, looks like WPA always does, never had a problem with it before. Great value. I picked up an extra 1,000 rounds for a carbine class I was taking. Ordered on Thursday morning and was shocked when FedEx dropped it off the next day! You guys definitely deliver! Thanks. Q: Will this .223 ammo work in my 556 .223 AR-15? A: Hi Mason. Steel cased ammo is a great bargain but before you invest in a large quantity, grab a few boxes and make sure YOUR rifle likes it. Most rifles will fire this just fine, but there are those rifles which will not. Q: I have heard WPA has a thick enough copper jacket to prevent barrel damage, whereas regular Wolf will damage it over time. Do you know if that is true or not? A: Hi Cody, Both of these have the same bi-metal jacketing. Therefore one would not wear more on your barrel than the other. Q: Steel core? Bimetal jacket? Indoor range use? A: Hello Andreas, This ammunition is loaded with a bi-metal jacketed bullet. Unfortunately it cannot be used at ranges that disallow ammunition which contains steel. A: Generally speaking, the shelf life on this Wolf WPA ammo is limitless. For best results, the environment they are stored in should be taken into consideration. It is best to avoid areas that experience a change in temperature, such as rooms that change with the seasons, weeks, or any type of garage environment. In the short term, these areas will not be an issue, though if you are looking to store rounds for decades, a cool dry area in a basement is ideal. 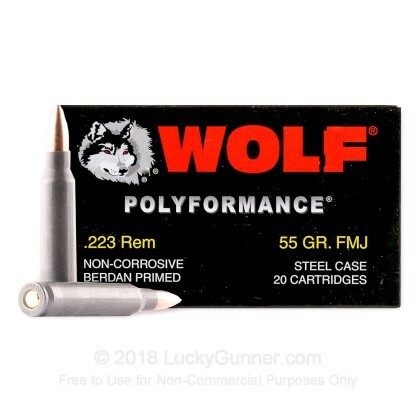 We also have this 223 Rem - 55 Grain FMJ - Wolf WPA Polyformance - 20 Rounds ammo in stock in a smaller quantity.